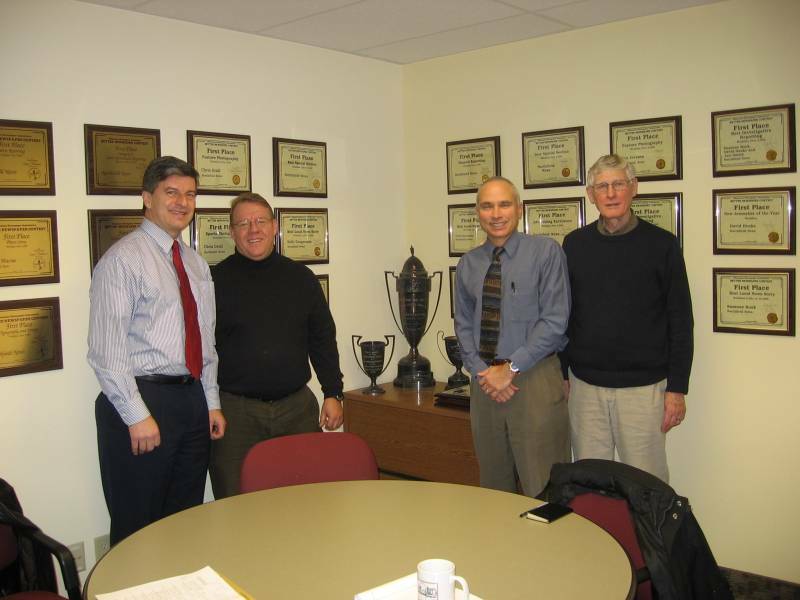 NDDC Board members visited our local newspaper, the Northfield News, for the 12th monthly session of 2011. A bit of disclosure, Sam Gett, Publisher of the Northfield News, is a member of the NDDC board. The owner of the News, Huckle Publishing, Inc. / Mainstream Publications, LLC, employs about 150 people in Minnesota. There are 15 to 20 people in the Northfield downtown office and 40 to 60 people at the Northfield uptown printing plant; there are a total of 10 to 15 full-time employees in Northfield. Sam, on a personal level, is very satisfied with Northfield. The company has papers in Faribault, Owatonna, Waseca, Kenyon, Lonsdale, St. Peter, Le Sueur, and Le Center. He says Northfield is the regional standard for civic aspiration and that most of the people in other towns are envious of our vitality. He loves the location and loves being downtown. As for the problems he and his business face in Northfield, he laughingly notes that historic buildings require substantial on-going maintenance. In terms of the community, he argues that the growing population of commuters is more of a challenge to engage. He thinks it’s important for our civic, economic, and social well-being to get these residents to identify with the town. Sam has clear thoughts on how the NDDC could better serve his business. He names supporting events, getting people engaged, advocating for business, supporting recruitment efforts, and removing obstacles to business expansion. He suggests that there should be more analysis of the impact of government regulations on business. Some protections are essential, he argues, but it is important to find the right balance. Finally, Sam offered some ideas on increasing the quality of life for workers in Northfield. He recommends expanding the richness of offerings of activities for kids and families and increasing the safety of mobility of kids and families to the downtown.